The rural areas, even today, form the backbone of India. Yet not many students from rural schools across the country complete 12th standard and go on to get a college education. We find that this is true even in the villages where Kalanjiyam is presently working. As one of our primary goals is to improve the education status in villages, we have a deep interest in encouraging and supporting students in the upper primary and high school to continue their education up to 12th and beyond. While the reasons for drop outs are many, when we talked to the families in these villages we received one common answer – their children were not interested in studies. We decided to then find out first hand the views and perceptions of the students in some of the villages and so conducted a survey among students of 8th to 10th standard across 20 villages. A questionnaire was designed in Tamil to elicit information about the aspirations of these students, their interest in studies, what they liked and disliked about their school environment, what the motivating factors were and what their future plans were. Field staff went door to door to identify students and interview them. A total of 538 students, between ages 13 and 18, from 20 villages were interviewed in this assessment. The sample of students comprised a similar proportion of boys and girls. About 31% of the students surveyed were in the 8th standard, 32% in 9th and 37% in 10th standard. A vast majority of the students came from households where the father’s main occupation was farming (37%) or agricultural labor (53%) and with low monthly family income of Rs. 2500 (45%) or Rs. 3000 (39%) per month. Only about 17% of students reported a monthly family income between Rs. 5000- 10,000 per month. The majority of these students (67%) travel anywhere from 3 km to 18 km to get to school while the remaining 33% reported that school was within a distance of 2 km from home. Regardless of the distance to school, most students walked to school (52%), while others cycled (21%) or took a bus (26%) and 5% of the students reported that they went to school by a free van service provided by Kalanjiyam in one of the schools. When we asked them about their interest in studies, all students reported that they were motivated to study; nearly 45% said that science was their favorite subject and 533 out of 538 students expressed that they wished to go on to college. Engineering, the police, nursing, law, teaching and medicine – these were the popular occupations that the majority of students (96%) wanted to get into after completing their studies. 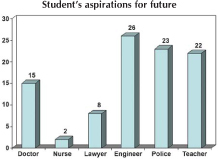 About 3% of the students expressed a desire to become a collector, minister, scientist and others and only 1% were not interested in studying further. All students said that this choice was their own, based on their interest in that particular field. Fifty per cent of the students also reported that they were interested in a particular occupation as they wanted to serve their villages in some way, offer free medical service, teach others what they have learnt or see to it that their community was free of crime. The most striking to note is the response of these students about their role models. About 19% of the students reported that their teachers were their role models while 78% said they did not have any. This strongly suggests that especially for rural students, teachers are often the only exposure to the outside world, and can strongly influence and motivate them. Most students were confident that their parents would support them toward their educational goals (71%) while 21% were not sure; the remaining 8% students felt that their parents would not support them or felt that the support would depend on the family circumstances in the future. Still when it came to finances, about 57% students feared that their parents would not be able to bear the cost of their education, another 41% thought that their parents would bear part of the cost (25% to 50%) or that they would take a loan. Finally, when we asked them what was the support or encouragement they required to pursue their goals, 85% said that they wanted encouragement from their parents and teachers and 14% said friends and the society should encourage them. Yet, in the present moment only 33% of students felt they had received any encouragement from their parents and far less from their teachers (11%). Given the above, let’s see what happens when these rural students complete the 10th standard. To find out we conducted another survey in the same 20 villages we had selected and went to all the homes that had students who had written their 10th standard exams in March 2009. A total of 168 students from these villages had taken the 10th exams and of these 43% (72 – 39 girls and 33 boys) had failed. Of those who had passed 84 were going on to the 11th standard in a school nearby, a few were going to work and the remaining were undergoing some vocational training. 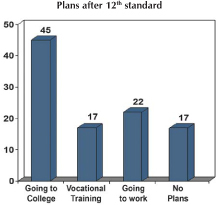 Of those who failed only 26 (36% of those who had failed) planned to re-take the exam. In the final analysis we found that 51% of those who passed the 10th standard were moving on to the 11th standard. Sixteen per cent of the students, regardless of whether they passed or failed were working, and 10% had no further plans or said they were not interested in studying further. Moving forward we tracked the outcome among all the students who took the 12th standard exams from the same 20 villages in March 2009. Totally 78 students took the 12th exam and of these 63 had passed. Forty five per cent (35 students) were moving on to college, while 22% planned to work and 17% wanted to do some vocational training. The remaining had no immediate plans. If this data can be considered a reflection of what’s happening across rural India, it says that no more than about 7% of the students who go to the 8th, 9th and 10th move on to college from rural areas. Cleary from the 8th-10th standard students we learned that it is not that these students lack motivation, on the other hand all of them expressed a desire to study and had high aspirations for their future. What happens to these students after this stage? Apart from finances, students need support and encouragement in their environment, in the school, from their teachers, parents and all those around them. In school, teachers and all educators need to help maintains students’ motivation and interest in various subjects. The school environment needs to be conducive to education, and have the resources to guide learning and to challenge students. School is the place where students spend a majority of their time, and for these rural students it is largely the only place where they are engaged intellectually. Many of the students in our survey reported that their favorite subject was science, but very few rural schools have access to a well equipped laboratory to engage and build on the students’ interest in science. Teachers have a powerful role here and can be a role model for students, help to build and sustain their interests in subjects and education in general. Needless to say, the role of parents is most crucial in influencing and determining their children’s educational attainment. Though many of these students come from families where both parents have little education, it is imperative that these parents and families motivate and encourage these students to aim higher, so as to complete their education. Beyond this as a community we all need to listen to the voices of these students and as a society enable more of our rural students to complete 12th and go on to college. For our part, Kalanjiyam is trying to work with communities, schools and students in finding ways to keep more students in school till 12th and getting them to college. Besides providing educational aid and advising parents and teachers on these issues, we have a program annually to motivate 10th standard students by offering a scholarship to those who secure more than 80% in the 10th exams. Every year since we instituted this program more students are securing more than 80% marks. The other change we see is that more than 80% of parents / guardians come with their children for the program. These we believe are steps in a positive direction. We need to recognise that every student starts going to school with a dream of achieving something big. If only we pay closer attention to the needs of these students and find ways of helping and supporting them, surely we can increase the chances for more of these rural students to go beyond 12th to college and realise their dreams. The author is Founder & Director, Kalanjiyam. He can be reached at .